Each month I send out a handmade card to everyone who places an order with me in the previous month. Those that order online and use the hostess code also receive a little gift from me as a thank you. I really appreciate everyone who chooses me to be their Stampin' Up! Demonstrator and I love to spoil my customers. It's always nice to receive a handmade card in the mail rather than a boring bill! I shared a sneak peek at these recently on my facebook page. This month's cards were really fun to make. The designer series paper is called Pick a Pattern and is full of fun animal and camping images. 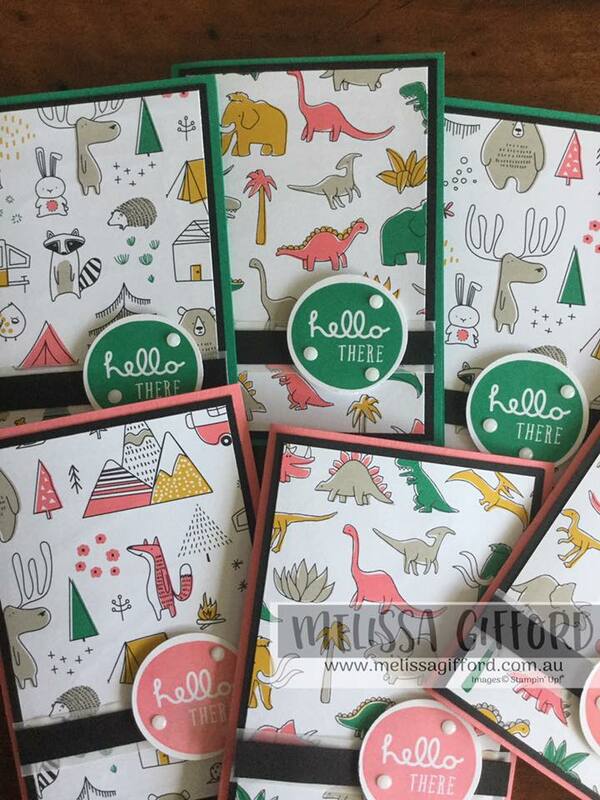 There is a coordinating stamp set called Pieces and Patterns where the 'Hello' sentiment comes from. I added a strip of vellum under a smaller strip of black jut to add a little interest. A sprinkle of white perfect accents, rhinestones or enamel shapes add a little something to the sentiment. These types of papers are fantastic for those male cards that are sometimes hard to make. Using the colours in the papers like crushed curry and emerald make for a nice neutral tone for males. Or use the fun images to create baby cards or kids birthdays. The sky is the limit!